Moveable Alphabets make it enjoyable for the child to consolidate the recognition of letter form, practice alphabetical order, beginning sounds, ending sounds, middle sounds, and the formation of entire words. 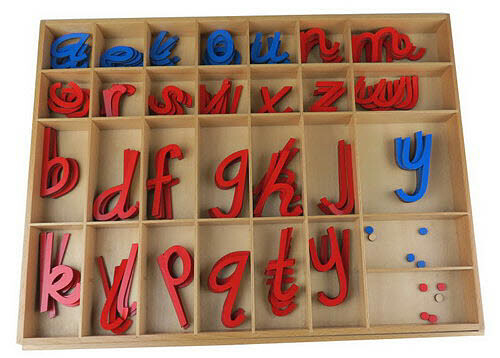 The Movable Alphabet set is designed to be used either with the Spelling Mat or freely on the child's work floor mat. This is a set of large wooden movable alphabet pieces in D'Nealian Font. The set contains red letters to represent consonants and blue letters to represent vowels. There are 5 of each consonant and 10 of each vowel. Depending on availability box layout may vary from the photo shown. Spelling mat is available for purchase separately.